1. First make the beet-balls. Warm a nonstick frying pan over a high heat. Add 1 tbsp of oil, then fry the onion and garlic for 2-3 minutes until starting to brown. Add the mushrooms and fry for a further 2-3 minutes. Stir in the tamari to coat the mushrooms, then remove from the heat. Put all the remaining beet-ball ingredients, other than the oil, into a food processor with the mushroom mixture. Pulse until smooth but still with a little texture. 2. Shape into 14-16 small smooth balls about the size of a squash or golf ball. Warm a nonstick frying pan over a medium heat with the remaining 2 tbsp of oil. Once hot, fry the beet-balls for 2-3 minutes on each side until golden and piping hot. Remove from the pan with a slotted spoon and keep warm. 3. Return the pan to the heat and make the tomato sauce. Add the onion, garlic, fennel seeds (if using) and chilli to the pan and fry for 3 minutes, stirring often, until starting to brown. Add the passata, maple syrup and salt. Bring to the boil, then reduce to a simmer and cook for 3 minutes stirring occasionally. 4. Meanwhile, cook the spaghetti according to the pack instructions. 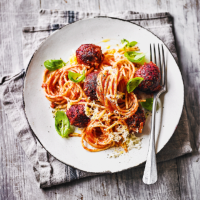 Serve with a generous serving of tomato sauce and 3-4 beet-balls per person scattered with some basil leaves and freshly grated vegan Violife.